Lately, I have been on the ride of my life. So much going on! Isn’t a semester abroad supposed to be the “easiest” of all your semesters while in college?! I thought I was busy back in Chicago, but that does not compare to here a t all!I recently started my internship at the American Chamber of Commerce, located in Beijing! 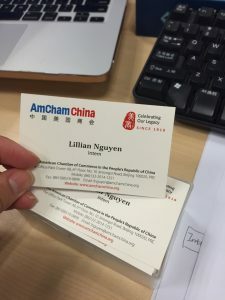 AmCham is basically a resource for companies from the United States (and beyond) to gain access to Chinese markets and business. They assist in all aspects crossing borders internationally. I work specifically under our Senior Director- John Zane. He is actually also on the board of directors at The Beijing Center as well…essentially he is my boss in every aspect of my life at TBC. He is the best! He challenges me at work and tells everything to me straight. My first day he gave me a stack of papers to examine and then told me that I would be writing a policy paper for him! That report would be sent to the American Embassy to be reviewed! That was nerve wracking because I was only used to writing papers andreports for class! 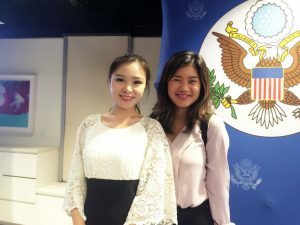 My latest work related event was a program that Amcham, the first in the series. It was called: Inter-Chamber Series- Career Women Forward. It was a joint task that consisted of the American Chamber, Australian Chamber, European Chamber, and many more. It is an initiative of dialogues from successful women from all around the world to share their story. Along with their awesome insight, they also spoke to the public about policies that they believe will promote gender diversity in the workplace. I got to visit the American Embassy here in Beijing and network with many people from all different industries. Although it is stressful, this internship has been the greatest opportunity I have had yet. It has taught me so much in so little time and I can finally say I have internationalized myself for my future career.